You should consider the Romertopf extra large German classic glazed clay cooker roaster gift idea for those who love baking and roasting. This glazed clay cooker is available in 4 sizes ranging from small, medium, large and extra large. The capacities range from 1.5 qt to 7.3 qt. The large size clay cooker holds 4 – 6 quarts and is suitable for a family of 4 – 6 members. The extra large 7. 3 qt clay roaster can feed 6 – 8 people. You can use it to roast an 18lb turkey. It comes with a glazed bottom and an unglazed lid. The glazed bottom makes it easy to clean. The unglazed lid must be soaked in water for about 10 minutes before cooking starts. This is to ensure the slow evaporation of steam in the moist enclosed internal capacity of the cooker. You can use it to cook meats, corned beef, vegetables, desserts and even for baking bread. 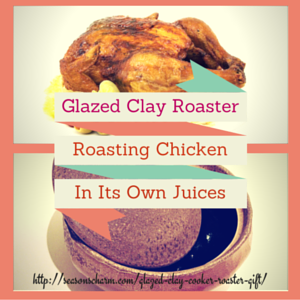 The glazed clay roaster can only be used in the oven or microwave. Using the large glazed clay baker cooker for roasting a whole chicken or turkey is simple and healthy too. You do not have to add additional oil or liquids. There is still room for some vegetables, onions, carrots or potatoes. You always put the clay cooker in a cold oven, then only set the cooking temperature and time. The chicken cooks in its own juices. This intensifies the natural flavor as well as retaining more vitamins and minerals. The cooked meat is tender and juicy. 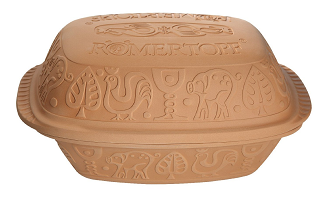 The Romertopf German classic glazed clay cooker roaster is a great gift for home chefs or anyone who loves healthy cooking.